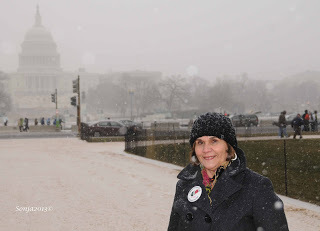 Bill and I travelled to Washington, DC for two main reasons, to visit our son and grandkids and to participate in the 40th anniversary of Roe v Wade March for Life. 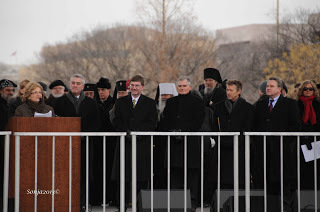 In fact, we planned on attending the March for Life since 2009. 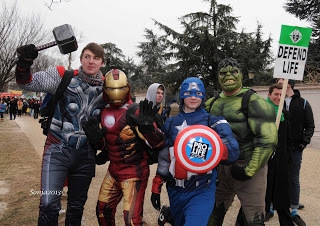 What we did not plan on was the freezing weather and snow. I can tell you there are not enough clothes to wear to stay warm. The route from the National Mall to the Supreme Court is a little over one mile. Before I left to DC I had contacted Kristan Hawkins, president of the Students for Life of America, an organization that has done a phenomenal job in teaching, training and supporting college students on spreading the Pro Life Movement. If we ever want to abolish abortion, the most heinous offense against mother and child since 1973, it will be through our youth, The Pro Life Generation. The energy and enthusiasm that the young people showed for this movement are encouraging and heartwarming. We could feel the excitement with every step. Kristan and I agreed on a time before the March for Life at the Family Research Center in DC and Kristan was ready for the interview. I found Kristan to be full of life and very engaged and energetic. Most importantly is her assertiveness that she expresses when she speaks. What is the progression of the Students for Life of America since you started working on this project? When I started full time with the Students for Life there were 180 existing campus prolife organizations across the country and today there are over 705 active prolife groups that we work with. 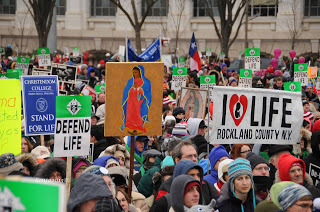 So what we are seeing is momentum building for the prolife movement. 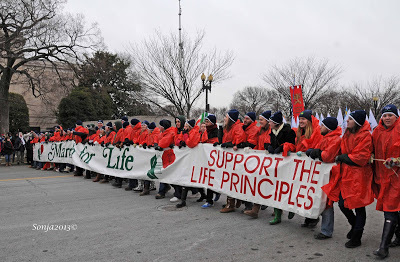 More and more students are getting activated, trained and organized to stand up for life. When I was in high school and college there was nothing like students for life out there for me or my friends to go to for help, for resources and support. How is the student prolife movement in Texas? Students for Life are very strong in Texas. Texas Right to Life is actually a great partner. They have embraced the youth of the prolife movement. They do their own camps and training workshops as well for youth. We have actually an intern from one of the Texas groups living with me this semester interning with us. We have a bunch of students… dozens of kids have flown up from Texas to be here for the March for Life and tomorrow for the National Students for Life America Conference which is sold out. 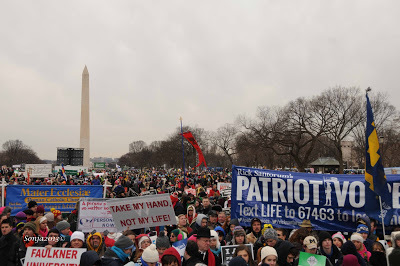 How many students do you think will be in the March for Life? Estimates are between 400,000 to 500,000 people will be here today in Washington DC. I would say that at least 60% will be young people. What do you see for the future for the pro life movement? I see a generation of survivors, these kids that have been born after 1973. They are going to keep getting stronger, getting trained and continuing on their activism. We see abortion being abolished in our life time. Once at the National Mall the mass of people gathered quickly for the rally. 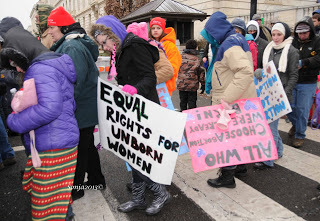 As you can see the freezing weather did not deter the Pro Life supporters from attending. It is estimated that this march was of historic proportions at over 500,000 marchers. There were definitely more people than in 2009 because there was an over flow into the sidewalks. The people stood close to each other providing body heat in an effort to stay warm. We waited to hear the speakers to begin at noon. Each speaker gave a short message of encouragement and how the Pro Life Movement has evolved. This is the Pro Life Generation echoed among the young activists. 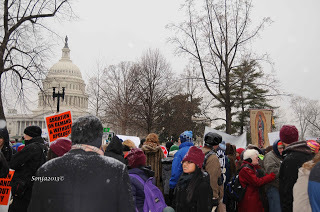 We were urged to talk about abortion to challenge everyone to stop the abuse to the unborn. Speaker John Boehner speaking via video told us that we must promote the culture of life, that we must make abortion a relic of the past. Bill and I were extremely cold, so we decided to enter the Smithsonian National Gallery of Art to warm up before we continued our walk. Here I met Morgan Burris, current Miss Delaware Teen, sitting without her shoes trying to warm her feet. She is a lovely young lady and a great role model for all teens and an advocate for the Pro Life Movement. Walking in the freezing cold while snow is falling - beautiful! 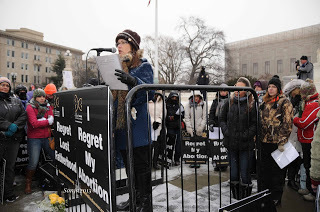 Co Founder of ‘Silent No More’, Georgette Forney spoke at the Rally with some powerful words of forgiveness. She is the president of Anglicans for Life and the other co founder of ‘Silent No More’ is Janet Morana, Executive Director of Priests for Life. Father Frank Pavone is the pastoral director. 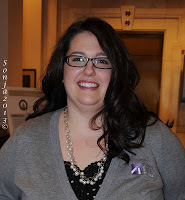 Forney even after 20 years since her abortion was emotional when speaking of her loss. She stated that part of her died along with the child she aborted. These are the courageous women and men who deserve our support. 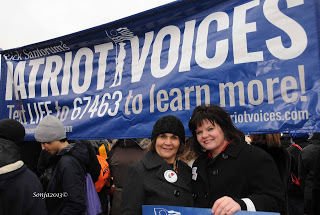 ‘Silent No More’ women gave testimony at the end of the march in front of the Supreme Court. Cathy Kerr, Regional Director of the Silent No More San Antonio office gave her testimony first. 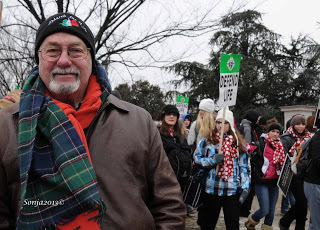 The March for Life 2013 did not receive the media attention it deserved, but the social media made up for it. Even the Pope tweeted to his over million followers. The following ad is about the most blatant display of total disregard for human life I have seen. Sadly it is a black man making the commercial of ‘Happy 40th Anniversary’ baby. It is NOT a white person leading the black people into killing their own unborn babies, it is a black man. It is obvious that the black people do not know about Margaret Sanger. They and so many women are being misled by obama, the most pro abortion president in history who promotes Planned Parenthood. Obama is leading the charge with his Health and Human Services mandate and his obamacare.